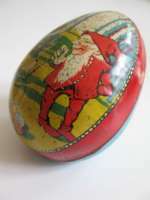 Old penny toy easter egg candycontainer, tinplate with Santa Claus and an easter bunnit. Christmas. Fine early easter egg in tinplate with Santa Claus and an easter bunnit. 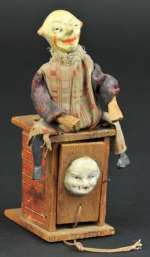 This a lovely lithgraphed collector item with a lovely decoration of a smoking father Christmas and an Easter rabbit. 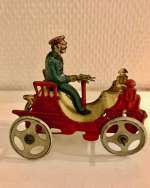 Made in Germany ca 1900. To open. A flat point made at the back for easy standing. A little wear to picture. Size 7,5 cm/ 3". 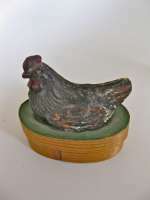 This is a lovely early Easter candy container of hen sitting on a light wooden candy container to open. The Hen is made of a wooden paper mache material, probably from the German Erzgebirge region. It would be lovely as an accessory in a doll house. It is in a wonderful condition all over. Ca 1880. 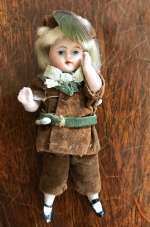 Size h. 6,5 cm /2 1/2" W. 7 cm ( 2 3/4") A very charming early item in great condition. This highly decorative set of carved furniture was made by Paul Leonhardt for the parlor room. This is large size. 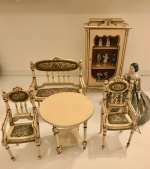 5 Pieces: The display cabinet, the lovely sofa, the round table, two arms chairs . The furniture is painted white and highlighted in gold. It is decorated with a cotton fabric with tiny patterns on a cream background.There is trim work around the fabric on the backs of the chairs and sofa. Although the furniture looks of a much earlier period, it was made ca 1920.. Measurements: Table- 4-3/4" h./ 12 cm with a diameter of 4-3/4"/ 12 cm. Arm chairs-6" h./ 15,5 cm. Display cabinet-9-3/4" h. x 4" w./26 cm x 14 cm. Sofa-6" h. x 6" w./15,5 cm x 15,5 cm. It is a really beautiful set. 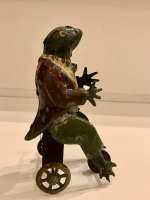 Although the furniture looks of a much earlier period, it was made ca 1920. Good condition. Glass on door missing. Some wear due to age. H.2" W.3".Ormolu wall lamp/Lovely Ormolu Double Sconce This Victorian ormolu lamp has beautiful scroll work to support the two branches with bristol lacey shades and bulbs. The back of the sconce has a hole for hanging. Circa: 1880 A beautiful piece for the medium size doll house. It messures W. 3" H. 2". No dent no discolour.A rare lightning feature.Made by Erhard & Söhne see the book from Swantje Köhler Dollhouse accessories.